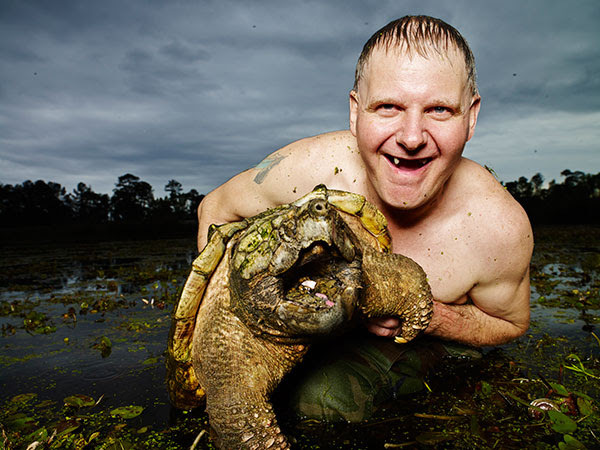 The Second Annual Turtleman Trek 5K is set for 9 a.m. on Saturday, March 14, 2015, and features a meet-and-greet with the Turtleman himself. Ernie Brown Jr., star of Animal Planet’s wildly successful series, “Call of the Wildman,” will be available for autographs and for photographs. The world’s most famous animal wrangler will be at the Marion County Heritage Center from the race finish until 5 p.m. The race begins and ends at the Heritage Center and passes a number of Turtleman’s hometown filming locations along the way: WhiteMoon Winery, Marion County Heritage Center, Stillhouse Restaurant, the Lebanon Tourist & Convention Commission, Limestone Branch Distillery and Sandusky Mule Barn. Race packet pick-up will be held on Friday, March 13, at Cedarwood Restaurant, which is featuring a special $10 Turtleman Pasta Bar from 5 to 8 p.m. A silent auction, showcasing items from local businesses and the Turtleman himself, will open that evening at Cedarwood and conclude on race day at the Heritage Center. Throughout the day on Saturday, the Marion County Cattleman’s Association will be cooking rib-eyes and burgers. There will be chip timing and free photos for every race finisher. Turtleman will not only start the race, but hand out awards as well in these categories: overall male and female winners and first, second and third place male and female winners in each age division. For more information about the Second Annual Turtleman Trek 5K on Saturday, March 14, 2015, visit www.Visitlebanonky.com/calendar-of-events/turtleman-trek-5k-2.